Asian Film Festival of Dallas (AFFD) celebrates its 12th year of bringing our ever-growing audience films that often cannot be seen on the big screen outside of their countries of origin. For one week each summer (July 11-18, 2013) at the Angelika Film Center in Dallas, TX, festival-goers and filmmakers escape the Texas heat with a variety of feature films and shorts, from all genres around the globe. Other films of note include Seeking Asian Female and Graceland. Get more details and ticket information here. This entry was posted in events, filmfestival, movies, texas on July 13, 2013 by Kevin Hsieh - channel APA. 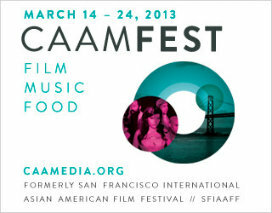 The Center for Asian American Media (CAAM) is excited to launch the 2013 CAAMFest. Formerly the San Francisco International Asian American Film Festival, CAAMFest is an 11‐day celebration of film, music, food and digital media from the world’s most innovative Asian and Asian American artists. Through live events, multimedia performances, and expanded ventures into the music and culinary worlds, CAAM has embraced new forms of artistic expression with the spirit of curiosity and adventure. Always pushing new ideas for creative ways to experience media, CAAM continues to stretch the concept and breadth of its Festival in 2013. LINSANITY: CAAMFest is proud to launch with the San Francisco premiere of LINSANITY. Directed by San Francisco native Evan Jackson Leong, LINSANITY captures the man and the cultural phenomenon that took over the NBA nation in February of 2012: basketball sensation Jeremy Lin. Straight out of its World Premiere at Sundance Film Festival, LINSANITY gives the audience courtside seats to Lin’s sudden rise, masterfully capturing the energy and frenzy that swept up this Palo Alto baller through a trove of home movies, jaw‐dropping game footage and intimate interviews with family members. LINSANITY is the first documentary to open the festival in over a decade. The evening continues with the Opening Night Gala reception at the Asian Art Museum with Director Leong in attendance. Coupled with culinary creations from some of the Bay Area’s most talented and innovative food purveyors, the Museum opens its doors with an exclusive viewing of China’s Terracotta Warriors. MEMORIES TO LIGHT: Ten days later, CAAMFest concludes with the official public launch of CAAM’s new home movies initiative, MEMORIES TO LIGHT: ASIAN AMERICAN HOME MOVIES. MEMORIES TO LIGHT is a national participatory arts project that aims to recover and make accessible a moving image library of the Asian American experience. Presented by acclaimed filmmaker Mark Decena, the closing night selection “The War Inside” captures six decades of home movies that CAAM has collected thus far. Through this project, CAAM hopes to digitize film (8mm, Super‐8, and 16mm) and provide an online streaming collection accessible through the Internet Archives, caamedia.org, and a series of public screenings. In collaboration with the Asian Art Museum, CAAM is pleased to present its New Directions Launch with the West Coast premiere of the film DOSA HUNT, a special set by Indian Bastards from Hell (featuring members of Das Racist), a curated menu by Café Asia, and local food trucks. DOSA HUNT, the brainchild of Stereogum.com’s Amrit Singh, assembles a who’s who of New York’s brown musical cognoscenti (Singh, pianist Vijay Iyer, and members of Das Racist, Vampire Weekend, Yeasayer and Neon Indian) to roam the streets of New York City in search of the city’s best dosa. Singh will be available for a Q&A following the screening. With expanded ventures in music and food, New Directions taps into CAAM’s adventurous spirit to bring this unique approach to the way we experience media. The New Directions segment continues with Directions in Sound and CAAM Salons. Directions in Sound will feature Dengue Fever, Jhameel and Vinroc. For CAAM cook salons, CAAM is bringing out local chefs Thy Tran (wanderingspoon.com), Pawaan Kothari (The Chai Cart), Lisa Murphy (Sosu), and Wendy Lieu (Socola) to refine your palate with the art of mixing spices and chocolate. Following a world premiere at the Toronto International Film Festival and a Gala Presentation spotlight at Vancouver International Film Festival, CAAM is thrilled to bring MIDNIGHT’S CHILDREN to the Bay Area for its San Francisco Premiere. Based on the celebrated 1981 novel written by Salman Rushdie, MIDNIGHT’S CHILDREN tells the tale of two boys born into opposite classes of wealth and poverty, switched at birth on the day India became an independent nation. Critically acclaimed Director Deepa Mehta is regarded as one of the most provocative and influential filmmakers to make an impact in world cinema. Her films are known for their bold, outspoken approach on issues of intolerance and prejudice, often evoking thoughts of cultural practices that both divide and unite us. No stranger to the CAAM family, Mehta has screened many of her previous films at the festival: Fire (1997), Water (2006) and Cooking With Stella (2010). At the School of Good and Evil, ordinary boys and girls are trained to become either extraordinary fairy tale heroes or nefarious villains. Join Soman Chainani, emerging screenwriter, graduate of the MFA Film Program at Columbia University and CAAM fellowship alumni, as he reads from the first book in THE SCHOOL FOR GOOD AND EVIL series. They’re back! After a sizzling debut in 2012, Sheetal Sheth, Lynn Chen and Michelle Krusiec return in this CAAM‐produced, web comedy Nice Girls Crew about three best frenemies and their crazy antics in a book club. For Season 2, Leonardo Nam (The Perfect Score, The Fast and the Furious: Tokyo Drift), Parvesh Cheena (Outsourced) and the iconic Tsai Chin (Joy Luck Club) join the cast. ASTRO BOY SPOTLIGHT: In celebration of its sixtieth anniversary, CAAM is bringing the iconic ASTRO BOY to CAAMFest. A global sensation, ASTRO BOY is a touching story of a child’s dream for world peace. Starting as a Japanese manga in 1952 by Osamu Tezuka, ASTRO BOY was the first official anime released in America. Our ASTRO BOY spotlight will be an all‐inclusive event featuring rare TV episodes, classic manga, video games, and of course, ASTRO BOY, the film. ROYSTON TAN RETROSPECTIVE: Royston Tan is a nuisance, a thorn in the side of the body politic. At the just legal age of twenty‐one, he began issuing forth a torrent of provocative films, such as 15 (2002), that inspired admiration from the critics and condemnation from the censors in his native Singapore. CAAMFest is excited to bring a selection of Tan’s most daring works and will also feature a postscreening conversation between experimental media artist Valerie Soe and Tan himself at the Pacific Film Archive in Berkeley. THE MONKEY KING: UPROAR IN HEAVEN 3D (OUT OF THE VAULTS): Composed of flowing animation created by hand from over 130,000 ink drawings and an opulent soundtrack inspired by the Beijing Opera, the film follows the adventures of the magical Monkey King of Flower Fruit Mountain. Based on the classic Chinese story Journey to the West, the original film was made at the height of the country’s golden period of animation. Released mere months before the entire film industry was shut down by the Cultural Revolution, it is a stunning work of animation and mythological storytelling, far surpassing anything China has produced before or since. READY, SET, PITCH! CAAM is thrilled to present the 2013 Ready, Set, Pitch! Panel. CAAM selects three to five media producers with projects in development to present their pitch to a jury of media professionals and a live festival audience. The winning pitch receives a CAAM challenge grant. At last year’s live fundraising pitch, four of the five projects reached their crowd‐funding goals. MEMORY OF FORGOTTEN WAR + CONVERSATION: As the launching point for CAAMFest’s Tides on the Korean War, MEMORY follows the stories of four Korean Americans who witnessed firsthand the Korean War’s devastation and aftermath. Following the screening, a panel of distinguished academics, artists and community leaders will engage in a candid conversation about the highly polarizing social and political issues surrounding the Korean War. This year’s Narrative Competition highlights six distinctive films, including DEAD DAD (dir. Ken J. Adachi), a comedic drama about three estranged siblings who reunite following the death of their father; GRACELAND (dir. Ron Morales), a twisty underground thriller set in the rabbit hole of Manila’s seedy underbelly; and SUNSET STORIES (dir. Ernesto Foronda & Silas Howard), a love letter to Los Angeles in the form of a mini road movie featuring Sung Kang (Fast & the Furious). Other competition films include ABIGAIL HARM (dir. Lee Isaac Chung), a Korean folk tale come to life in New York; LATE SUMMER (dir. Ernie Park), an Ozu‐inspired film set in the Black South, paired with a conversation with acclaimed film essayist Kogonada; and SOMEONE I USED TO KNOW (dir. Nadine Troung), a story about losing our way and finding our friends featuring an ensemble cast including Brian Yang (Saving Face, Hawaii Five‐O), Rex Lee (Entourage), and Eddie Mui (Gone in Sixty Seconds). The Documentary Competition features eight films including five films from CAAM’s Media Fund program: HIGH TECH, LOW LIFE (dir. Steven Maing), an exploration of China’s digital divide and rise of its netizen culture; THE MOSUO SISTERS (dir. Marlo Poras), a poignant account of Beijing’s dwindling economy and its impact on the lives of two sisters; SEEKING ASIAN FEMALE (dir. Debbie Lum), a highly intimate documentary about an unconventional relationship; SEEKING HAVEN (dir. Hein S. Seok), a daring reveal of the often overlooked story of North Korean defectors; and WHEN I WALK (dir. Jason DaSilva), the point‐of‐view telling of a filmmaker with multiple sclerosis. Other documentaries include HARANA (dir. Benito Bautista), a cinematic serenade to the abandoned art of harana; MARILOU DIAZABAYA: FILMMAKER ON A VOYAGE (dir. Mona Lisa Yuchengco), a fascinating portrait of the first lady of Philippine cinema; and XMAS WITHOUT CHINA (dir. Alicia Dwyer), a challenge to the media hype surrounding China‐made goods. New to this year’s festival is the Great Star Theater in San Francisco Chinatown. Reopening after 10 years, the addition of the Great Star Theater reintroduces the public to a space of cultural expression and art. As CAAM marks its transition from a traditional film festival to CAAMFest, it also presents an exciting new way to navigate the program. An alternative to typical festival sections, CAAM Tides highlights key themes that are threaded throughout the program, enabling the festivalgoer to experience the new waves of culture that are hitting shores in the Bay and beyond. ABOVE THE LINE (Women in Media): Media craves the unique voice, and in this slate of female‐backed projects the creative vision is clearly driven by women. From filmmakers to actresses, musicians to chefs, ABOVE THE LINE showcases the new wave of women succeeding across all spectra. AGENT/ADVOCATE (Brave Creators): AGENT/ADVOCATE highlights visionaries who dare to tap into the most controversial and sensitive issues of our time. More than merely seeking provocation, these artists push their audiences to question troubling political, economic and cultural realities. BEYOND BOUNDARIES (On the Anniversary of the Armistice): Unknown or forgotten by most Americans, the Korean War divided a people with several millenniums of shared history. Utilizing the documentary MEMORY OF FORGOTTEN WAR as a launching point, BEYOND BOUNDARIES explores the societal repercussions and cinematic incarnations of the Korean War. ECONOMIES OF POWER (Examining Present‐Day China): Few topics spark more interest and inquiry as the rising economic power of China. In this intriguing selection, filmmakers provide a human face and layered narratives to the story of Chinese, Americans and Chinese Americans. NEW CUTS (Creative Adaptations): These programs embody the ever‐evolving practice of creative adaptation. Whether turning contemporary literary masterworks or legendary folk tales into films, charting how a popular anime figure is reshaped through the years, discovering new flavors in traditional dishes, or remixing old soul and hip‐hop into modern sounds, these events will open eyes to the possibilities–and pleasures–of creative re‐interpretation. This entry was posted in events, filmfestival, san francisco on February 20, 2013 by Kevin Hsieh - channel APA. Continuing the work of the Northwest Asian American Film Festival (NWAAFF) directed by Wes Kim from 2003-2007, the Seattle Asian American Film Festival (SAAFF) kicks off in 2013. The festival’s mission is to seek out, promote, produce, and develop Asian American artists with a commitment to original and innovative media works. New program directors Kevin Bang and Vanessa Au are leading the revival of SAAFF. The Seattle Asian American Film Festival will showcase works by northwest Asian American filmmakers, as well as films from across the country dealing with Asian American people, issues, and themes. All screenings will take place at the Tateuchi Story Theatre at the Wing Luke Museum. Among the films on the program are A Lot Like You, Hibakusha, Keye Luke, The Chinese Gardens, The Crumbles, House of Suh, and Jake Shimabukaro : Life on Four Strings. This entry was posted in filmfestival, seattle on December 7, 2012 by Kevin Hsieh - channel APA. The 2012 San Diego Asian Film Festival (SDAFF) runs November 1-9, 2012 at the Mission Valley UltraStar Cinemas (7510 Hazard Center Drive, San Diego, CA 92108). As one of the largest film exhibitions of its kind in North America with more than 150 films from 20 countries this year’s Festival features exclusive North American and West coast premieres, screening locations throughout San Diego County, a lifetime tribute to FIVE FINGERS OF DEATH director Chung Chang-wha, and a Gala Awards Dinner. Opening Night film on Thursday, November 1 at the North Park Birch Theatre with the award-winning documentary DON’T STOP BELIEVIN’: EVERYMAN’S JOURNEY, about all-American rock band Journey’s search for a new lead singer, and their controversial but utterly spectacular find: a formerly homeless cover-band frontman named Arnel Pineda of the Philippines. Director Ramona Diaz is scheduled to attend. Other films of interest include Viette, Yes, We’re Open, Jake Shimabukuro documentary, Seeking Asian Female, and I Am A Ghost. San Diego Asian Film Festival expands its screening locations reaching North County and Uptown and slowly becoming a city -and county-wide film festival. For the first time since 2001, five different locations will serve as host to Festival films including an Opening Night at North Park Birch Theater, Taiwanese Film Showcase at University of California San Diego, Cinepolis Del Mar, and Museum of Photographic Arts. The central theater location will be located at UltraStar Cinemas Mission Valley at Hazard Center. As always, the San Diego Asian Film Festival premieres many of Asia’s hottest films. Notable North American Premieres include NUCLEAR NATION (Berlin Film Festival, Hong Kong International Film Festival), ARCHITECTURE 101 (one of the biggest Korean hits of the year), and CHA CHA FOR TWINS (Best Narrative Film, Taipei Film Festival). Major West Coast Premieres include the latest from the world’s top directors: Apichatpong Weerasethakul’s MEKONG HOTEL, Sion Sono’s THE LAND OF HOPE, Kim Jee-woon’s DOOMSDAY BOOK, and Yoshihiro Nakamura’s CHIPS. SDAFF is also proud to host the West Coast Premieres of some of the most talked-about discoveries on the international festival circuit: APPARITION (Philippines), SLEEPLESS NIGHT (South Korea), HENGE (Japan), LATE SUMMER (USA), MEMORIES LOOK AT ME (China). You can get tickets to the 2012 San Diego Asian Film Festival here. This entry was posted in filmfestival, san diego on October 21, 2012 by Kevin Hsieh - channel APA. The 2012 Philadelphia Asian American Film Festival will run from Wednesday, November 7, 2012 to Saturday, November 17, 2012 (with a break from Mon, Nov 12th to Thurs, Nov 15th) at the Ibrahim Theater at the International House (3701 Chestnut Street, Philadelphia) and the Asian Arts Initiative (1219 Vine Street, Philadelphia). Things get started on launch night with the film No Look Pass, the coming-of-age, American Dream story of Emily ‘Etay’ Tay. The opening night film this year is Shanghai Calling, a romantic comedy about modern-day American immigrants in an unfamiliar land, which stars Daniel Henney and Bill Paxton. The centerpiece film is White Frog, a universal story of the power of family, friendship, and love. The closing night film is Pearls of the Far East, which follows the inner lives and forbidden loves of seven Vietnamese women. Other films of interest include Sunset Stories, I Am a Ghost, Uploaded: The Asian American Movement, and Yes, We’re Open. Also be sure to check out short films like The Potstickers and The Division. You can get tickets here. This entry was posted in filmfestival, philadelphia on October 19, 2012 by Kevin Hsieh - channel APA.